NOTE: An unfinished version of this review was put up because of some weird glitch with WordPress. Below is the complete review. Thanks to this DVD, I have resolved never again to watch behind-the-scenes special features before writing these reviews. 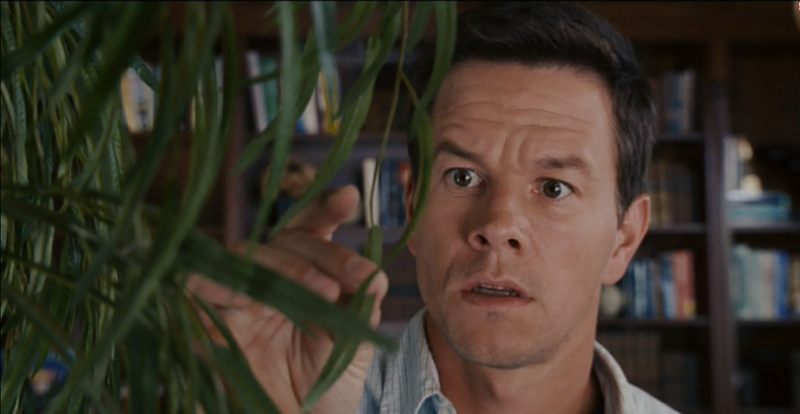 The Happening is a hilariously bad movie. But like all movies, a colossal amount of work went into it and everyone involved was trying hard to make it good. Watching the “making of” featurettes on the DVD was a somewhat depressing exercise and it got me thinking about where it all went wrong. Ludicrous plot? Terrible acting? Poor direction? Well, let’s dig in and find out what makes The Happening so cringe worthy. Hint: This is part of it! The first scene takes place in Central Park, where a woman observes everyone around her stop what they’re doing and begin searching for ways to kill themselves. This is a somewhat creepy moment, but it’s ruined by plot holes when we discover what’s causing such things to happen; but we’ll get to that in minute. 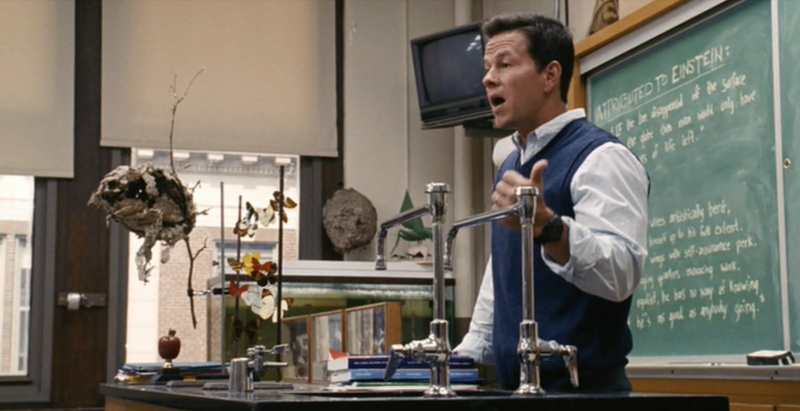 We’re then introduced to our hero, a schoolteacher played by a vegetative Mark Whalberg. He and his wife; the horribly miscast Zooey Daeschanel (who seems to play the exact same character in everything she’s ever been in) have a relationship that’s been on the rocks lately. Can they salvage their love in the midst of this mass disaster? Why do perfectly healthy people suddenly want to kill themselves? With proper writing and many, many better decisions, this may have turned out to be a good movie. But there are so many problems here; the only way to properly describe them all is in a classic bullet point list. Terrible performances from normally talented actors. It seriously feels like everyone is reading the script for the first time. Ridiculous twist. Spoiler alert here just in case you haven’t seen the movie. It turns out that the trees (not any specific species mind you, just “the trees”) are releasing chemicals that erase the human instinct for self preservation. While it is true that many plants use toxic or pungeant chemicals to defend against predators or claim an area of soil; the idea that they can just create new poisons and release them at will against a single species is ludicrous. Also, how was that one woman at the beginning not affected? Apparently the movie takes place over a period of one or two days. In this time, scientists figure out what the chemical does, where it’s coming from, and have already organised press conferenes and TV interviews. Not to mention entire cities are evacuated. The kid in this movie (oh yeah, I forgot to mention the whole depressing John Leguizamo and his daughter subplot that ends with his death before the halfway point) has an Avatar: The Last Airbender backpack, foreshadowing another Shyamalan bomb. I’m just scratching the surface here. There are SO many things wrong with this movie, that you have to experience it to truly understand. And it proves that just because you work really hard on something; it doesn’t mean it’s going to be any good. I thought I wanted to see this but something about the adverts I had seen made me hold back – Now, reading your review, I think I will pass. It’s kind of worth it for a laugh, but if you’re looking for a good scare, this isn’t the right movie.